Two 1,000 tonne bridges are set to be slid into place later this month as part of an innovative engineering solution on the £1.5bn A14 Cambridge to Huntingdon improvement job. The bridges have been built at the side of the road and will be wheeled into place over just one weekend to cause minimum disruption to traffic by joint venture Balfour Beatty, Skanska, Costain, CH2M and Atkins. Over the past few months they have built four abutments to support the new bridges as well as two 44 metre bridge decks at the side of the live carriageway. The new bridges at Bar Hill, will be installed during the weekend of 14 September. 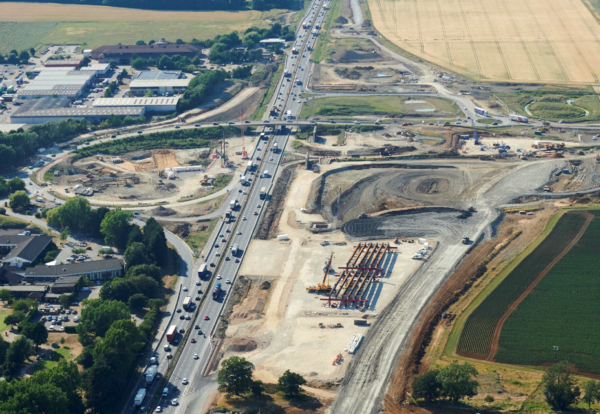 They will form a new, improved Bar Hill junction which will connect the A14 to the future local access road between Cambridge and Huntingdon, as well as to the existing local road between Bar Hill and Longstanton (B1050). “I am delighted that we’ve found a way to build the two bridges while keeping the A14 open as much as possible and disruption for people locally and road users to a minimum. The new bridges will ultimately replace the old crossing which will be demolished in 2019.